Tucked behind a grove of mature trees is where you’ll find Frisco’s newest master-planned community. Here, you’ll encounter a village that feels as fresh as it does familiar with meandering streets, adventurous parks and all-new discoveries around every corner. Welcome to The Grove Frisco New Homes for Sale! First, you’ll meet up with neighbors over coffee at Orchard House, go swimming and grilling with the family at the water oasis and wander the 4.5 miles of trails. 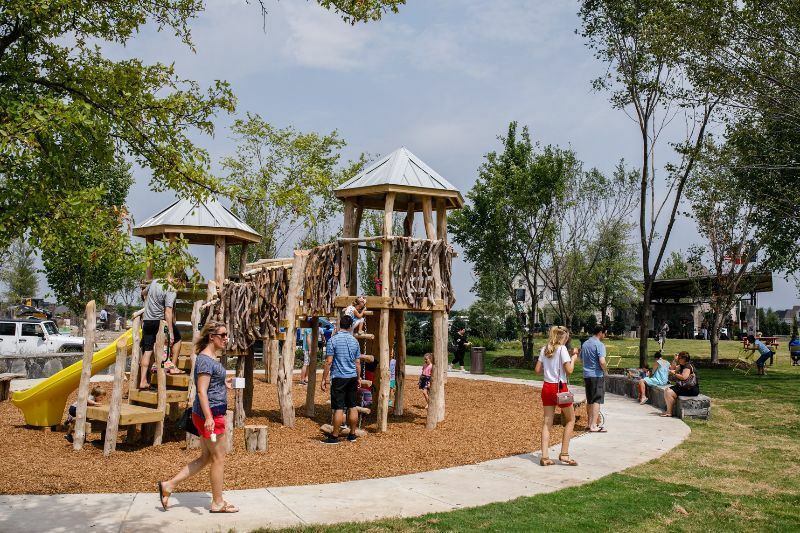 Then, you’ll find yourself exploring 20 acres of open space where there’s always something new around every corner, with naturally inspired playgrounds, dog parks, trails and more to come. Enter through the doors of our modern farmhouse and you’ll be greeted by the warm light and wonderful sounds of a lively community. There are planned meeting rooms and cozy spaces, a fireplace and fully equipped fitness center. It’s homey yet modern, and ready for any kind of activity. Within Orchard House, you’ll find a Café and a quaint dining space. The bakery will be whipping up a yummy collection of delectable treats and feasts. It’s the perfect place to enjoy a made-to-order coffee, mid-day salad, smoothie or chocolate ice cream cone. Just beyond the main hall of Orchard House, you’ll see an inviting patch of green where you can enjoy lunch al fresco and play a lawn game or two. It is also an ideal setting for outdoor dinner parties and community gatherings or just a few friends sipping cocktails. 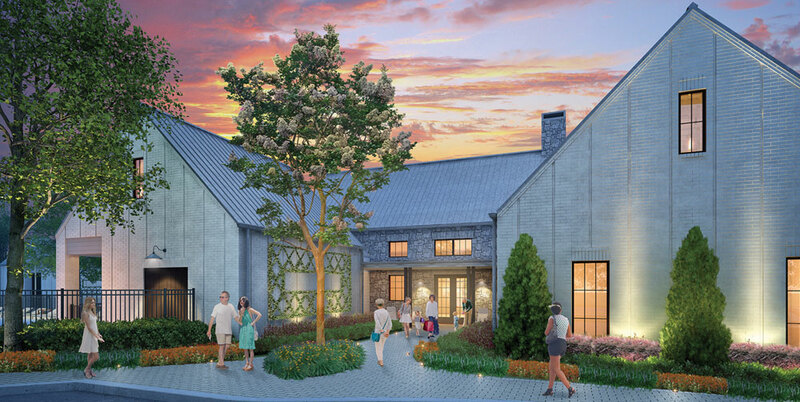 An open-air gathering space for residents of The Grove Frisco is planned across from the great lawn. There will be stage for local performing artists, but it will also be a place for friends to sit and meet up in the park, find some shade along the trail, and function as center stage for community events. With so much to offer it’s no surprise that families from all over the country are flocking to The Grove Frisco New Homes for Sale. On the other side of the Orchard House, near most of The Grove Frisco New Homes for Sale, you’ll find our planned water oasis. Smartly designed for all ages and all types of fun, Frisco summers will become a favorite for Grove residents. 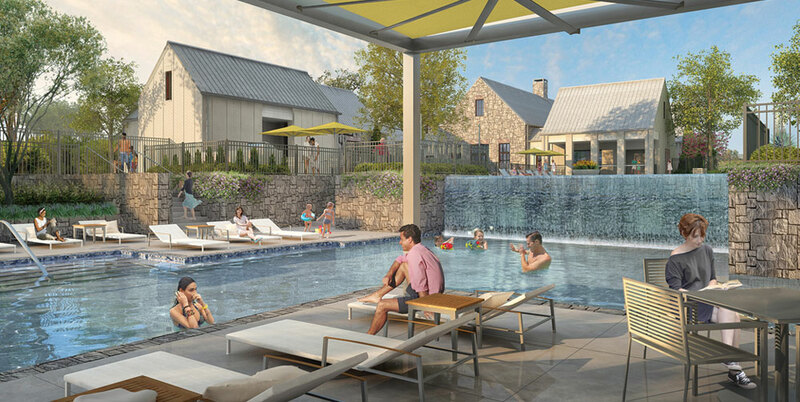 The Grove Frisco will feature two heated pools. The first is elegantly planned with an infinity edge that cascades into a waterfall feeding the lower pool. The lower pool will be shallower and adjacent to the splash pad, making it perfect for kids of all ages. With generous grilling and concession facilities coming soon, warm days and crisp nights are all you’ll need to enjoy a barbecue or a snack poolside with friends and family throughout the year. Additional information about The Grove Frisco New Homes for Sale can be found calling or stopping by our office located just south of The Grove Frisco in the master-planned community of Castle Hills. When looking to buy a new home in The Grove Frisco or sell a home in The Grove Frisco it is always best to use an experienced Frisco Realtor. If you are interested in The Grove Frisco New Homes for Sale & Real Estate call Renee Mears at 972-489-0828. We want to make you a part of Frisco’s most recent new home communities. Sign up today to be the first to receive information about VIP pricing, pre-grand opening events, features, site plan, floor plan and much more. Fabulous one and a half story with 4 bedrooms (3 on first floor) 3 full baths, 2 powder baths, 2 dining areas, game room and courtyard situated on a interior lot facing a neighborhood park. Home features dramatic rotunda foyer, huge kitchen island, cathedral ceiling in family, master bay sitting area and tech center study niche upstairs between game and bedroom suite. Wood floors and wooden staircase plus much, much more. Bedroom 3 offers private entrance from courtyard. Ready now. MLS# 14044154 - Built by Highland Homes - August completion! ~ Popular and sought after Highland floor plan, oversize master suite with bay window, Media room DOWN, 2nd Master on the 1st floor, 20 ft vaulted ceiling in FR with accent beams, large kitchen island, extensive hardwood floors on first floor, Stainless Steel appliances. Appreciate the privacy of the game room upstairs. Our 2 story model plan with 4 beds, 4 full baths, 1 powder bath, 2 dining, study, game room, media, 3 car split garage on a north facing cul-de-saac lot next to greenbelt. Home features custom contemporary version of our model without dining columns for a more open feel, dramatic curved staircase with windows and sliding glass doors to the patio. Amenities include painted white elevation, gray wood floors, white kitchen cabinets to the ceiling and fabulous light package. Ready early April 2019. MLS# 14029740 - Built by First Texas Homes - June completion! ~ The Seville is a one story family home with an exterior brick accented with a stone; the garage is 2-car front entry. Upgrades include: a sitting area in the master bedroom, a soaking king tub placed in the master bathroom, tile, light, and cabinet additions, granite counter tops, wood floors, and Frigidaire professional series stainless steel appliances. Other amenities include energy saving tank less water heater, pre-wired security system, covered patio, and a fenced backyard. At first Texas Homes, we don x2019;t disappoint; let us build your dream home today! Come in today and ask about our Inventory Specials! NEW CONSTRUCTION built by Southgate Homes. Scheduled to complete this summer! We added the Master Bay window, Powder bath and Media room. The Ashland x2019;s lovely covered entry welcomes guests into an impressive two-story foyer. The sunlit family room with a trio of windows is adjacent to the expansive kitchen. The main living areas in this plan flow seamlessly into one another which makes for a great entertaining space. Additional features include a generous covered patio, secluded master suite, and conveniently located laundry room. New construction built by Southgate Homes in The Grove. Same plan as the decorated model. Scheduled to complete in June and on a cul-de-sac lot! The Hanover x2019;s elegant, spacious living, and entertaining make it so livable. The impressive foyer draws the eye to the bright, expansive great room. The well-appointed kitchen features a large center island, generous walk-in pantry, and sunlit breakfast nook. The master bedroom is enhanced by an expansive walk-in closet and spa-like master bath. Additional highlights include a versatile first-floor bedroom with a full bath, conveniently located laundry room, and downstairs media with access to the covered patio.